A great feature in WordPress is automatic updating, it makes life easier for administrators and the feature is now integrated into everything from updating the core software to individual plugins and themes. 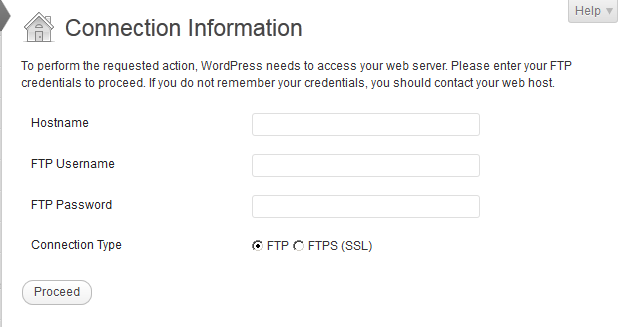 A very common configuration problem that people run into with auto-updating is when Worpress prompts you with "To perform the requested action, connection information is required", and asks you for FTP credentials. First: Why is this happening? In version 2.6 WordPress introduced the Filesystem API which governs all the functionality needed for reading and writing local files to the filesystem. The API supports most host types, and ensures that these procedures are done securely. Security is likely why you are receiving the FTP prompt in the first place. WordPress checks to see whether or not it has permission to directly write to the filesystem. It also goes one step further and makes sure that if the files being written are under the same user account as the user account that owns the system. If this is determined to be false the FTP prompt is displayed as the next best solution. Given the scenario a lot of people might try to run Chmod (a unix script that allows you to adjust read/write permission on folders). Chmod is actually rather far from the solution, so don't try writing a bunch of 7's into the folder permissions! Opening up the folder's permissions is bad practice anyway, and WordPress isn't looking for you to "fix" things like that (no properly written application will). WordPress is actually requiring you to make sure that the user account running WordPress is the same account that owns the directory your site is operating in (the Apache user). To do this, you need to change the WordPress user not the existing user's permissions! Run this code from the WordPress folder and you'll be shown the Apache user account's name. In the example above, the Apache user name (taken from step 1) is "root", and the target directory is named "wordpress". If you are the server administrator, for security purposes I don't recommend running Apache under the root account or naming the WordPress folder "wordpress". However for the sake of an easy-to-follow example I wrote the code as such. If you are using Webmin, open up the File Manager and navigate to the WordPress installation. Click on info and change the user name under ownership to Apache's user. Make sure this applies to this directory and all subdirectories and you're set! I told you these were two very easy steps! Now you should be able to automatically update your WordPress installation, and you have the peace of mind knowing your WordPress filesystem is properly configured!